Of late, the majority of cryptocurrencies have been lurking amid the spark of bearish pressure, pricing disparities at the different exchanges offer luring arbitrage opportunities to exploit. As the potential yields may vary from exchange to exchange, Bitcoin and its peer group and counterparts have tumbled off dramatically. Well, on the eve of New Year, the triangular trading options could fetch us a handsome sum of returns, the following instances would bring-in the such opportunities owing to the pricing differences. Please be noted that the BTC pricing against dollar at the same two different exchanges, BTCUSD at Bitfinex and BTCUSD at Bittrex. 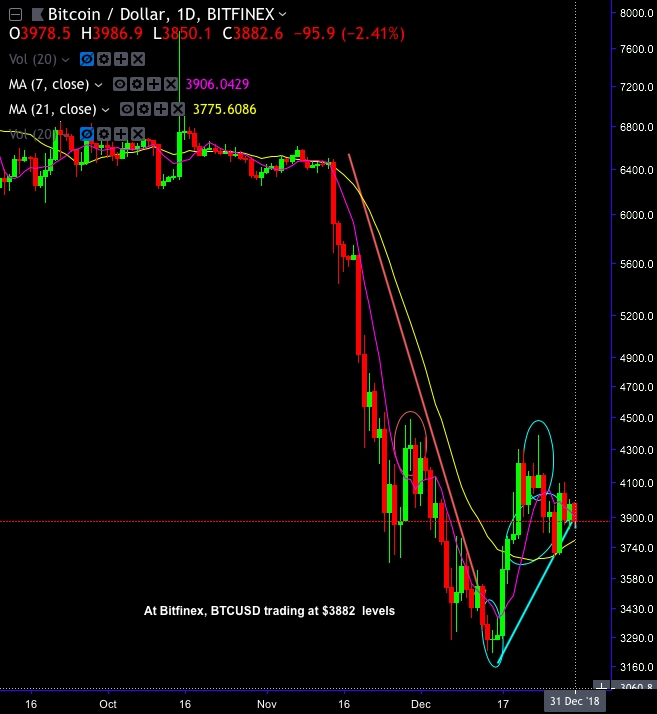 There exists a disparity in their respective prices $3882 at Bitfinex and $3748 at Bittrex. Thereby, buying Bitcoin on the Bittrex exchange with USD and transferring the bitcoin and converting it back into USD on Bitfinex likely to derive a profit of just over 3.57%. As you could observe the XRP pricing against dollar at two different exchanges, namely, XRPUSD at Bitfinex and XRPUSD at Bittrex. Please be noted that the existence of a disparity in their respective prices 0.36708 at Bitfinex and 0.3550 at Bittrex. Thereby, buying XRP on the Bittrex exchange with USD and transferring the same and translating it back into USD on Bitfinex allows us to derive considerable returns, Likewise, ETH also renders the similar results. ETHUSD on Bitfinex and ETHUSD on Bittrex is at $140 and $133 respectively. Thus, procuring Ethereum on the Bittrex exchange using USD and transferring the same and converting it back to USD on Bitfinex would lead to a profit of just over 4.10%. Currency Strength Index: FxWirePro's hourly BTC spot index is inching towards -35 levels (which is mildly bearish), while articulating (at 13:03 GMT).